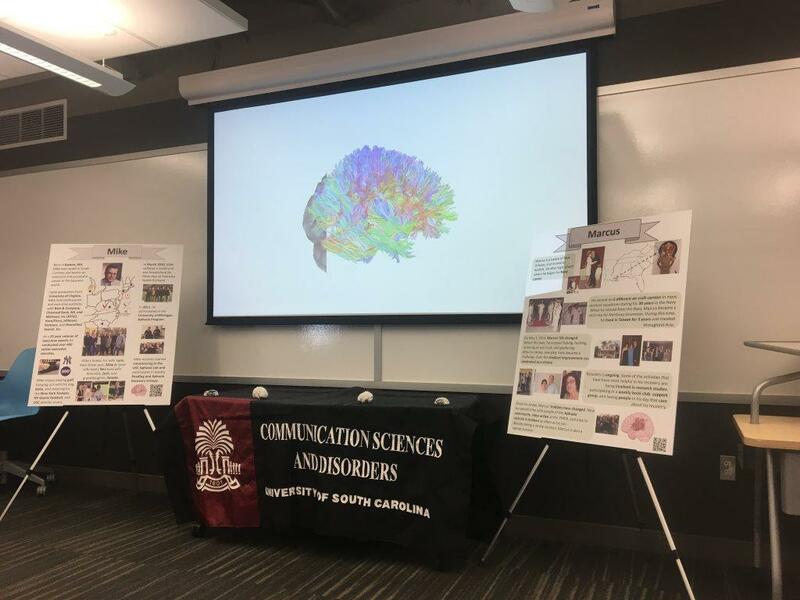 Members of the communication sciences and disorders (COMD) department’s Aphasia Laboratory shared information about their innovative efforts to improve stroke recovery with university faculty, staff and students and the public at UofSC’s Creativibe in March. The free afternoon event, themed Think Outside the Coop, included subthemes related to technological innovation, solving community problems, creativity explored and creativity in practice. Event coordinators described Creativibe as an interdisciplinary collision with groundbreaking art, virtual reality, robots and artificial intelligence that is part festival, part competition and part think tank. Altogether, Creativibe showcased 100 expressions of creativity, experimentation and innovation from nearly every discipline across UofSC. 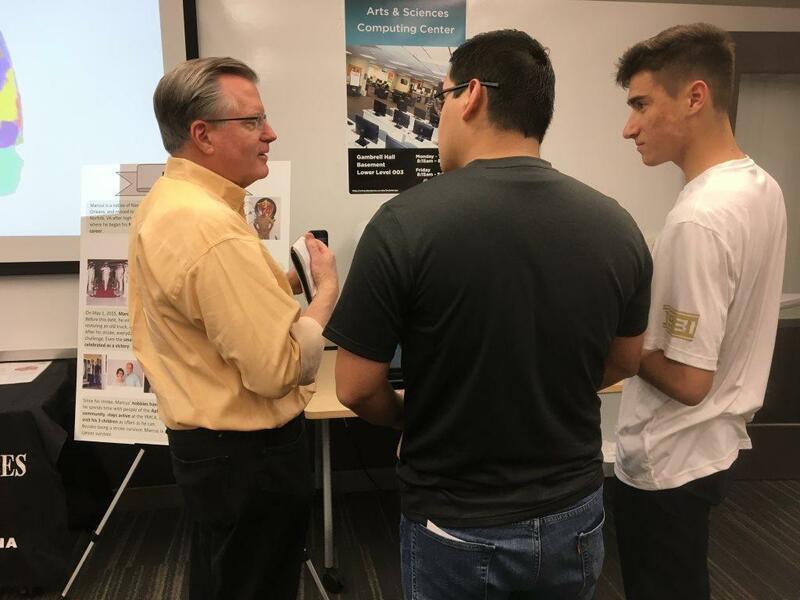 The event included 20 workshops, 15 student performances, eight talks on creative living, and 60 interactive exhibits. 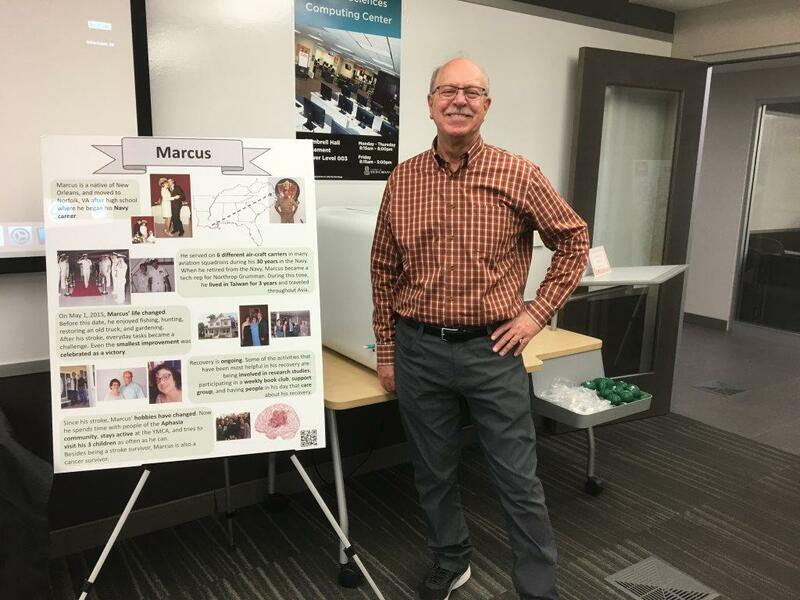 One of those exhibits was hosted by the Aphasia Lab, which is directed by COMD professor Julius Fridriksson. 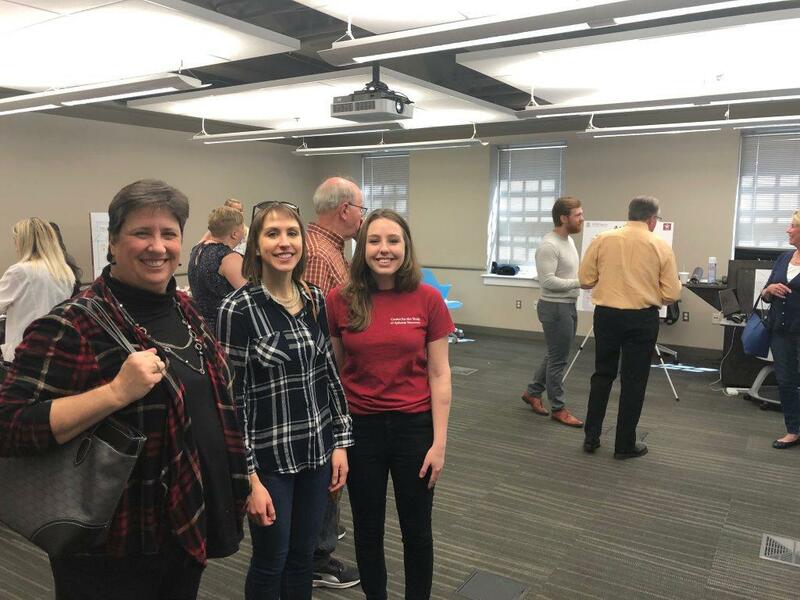 Organized by COMD doctoral students Lynsey Keator, Sigfus Kristinsson and Lisa Johnson, the exhibit was entitled CreateABrain. Working with other members of the lab (e.g., undergraduate volunteers Whitney Footman and Maeve Kelly) as well as faculty and staff from departments across campus (e.g., psychology’s Chris Rorden and Roger Newman-Norlund and Jason Dean from the College of Arts and Sciences Computing Center), the team collaborated to educate the community about stroke and aphasia, a communication disorder resulting from stroke or injury to the brain that impacts patients’ ability to speak, listen, read and/or write but does not affect intelligence. The group’s presentation included a slide show highlighting the lab’s innovative work as well as interactive visuals of the different imaging techniques they use. 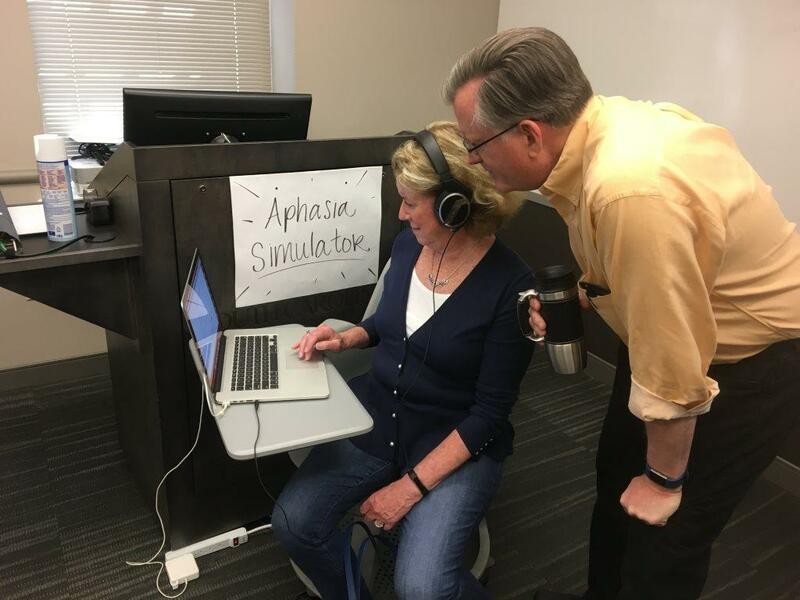 They also incorporated an aphasia simulator to help others understand what it’s like to have aphasia and displayed infographics highlighting the need for increased awareness of stroke and aphasia as public health concerns, particularly in South Carolina. In addition, the CreateABrain exhibit featured a 3D printing of President Harris Pastides’ brain in real time (based on an MRI scan conducted in the lab) and several other 3D models of brains. 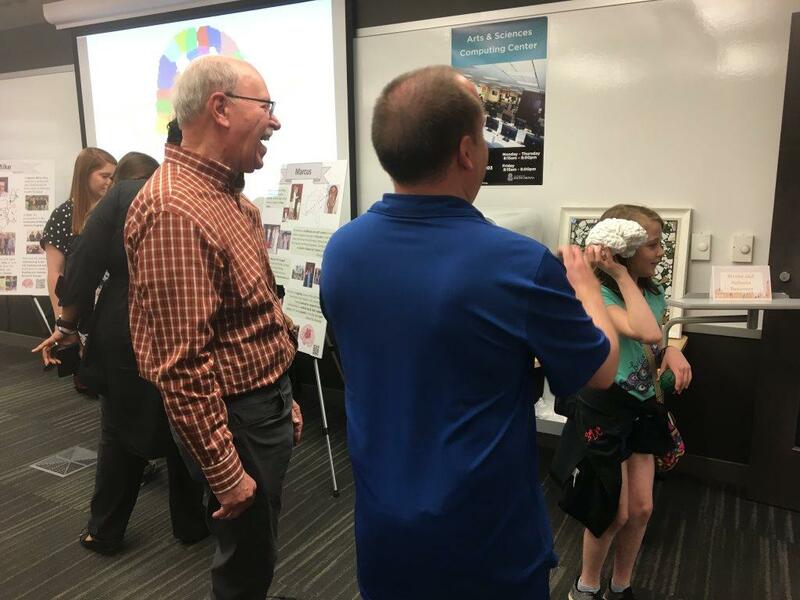 The CreateABrain exhibit was particularly enhanced by the presence of two of the lab’s study participants, both of whom are stroke survivors and very active in the Aphasia Lab community. 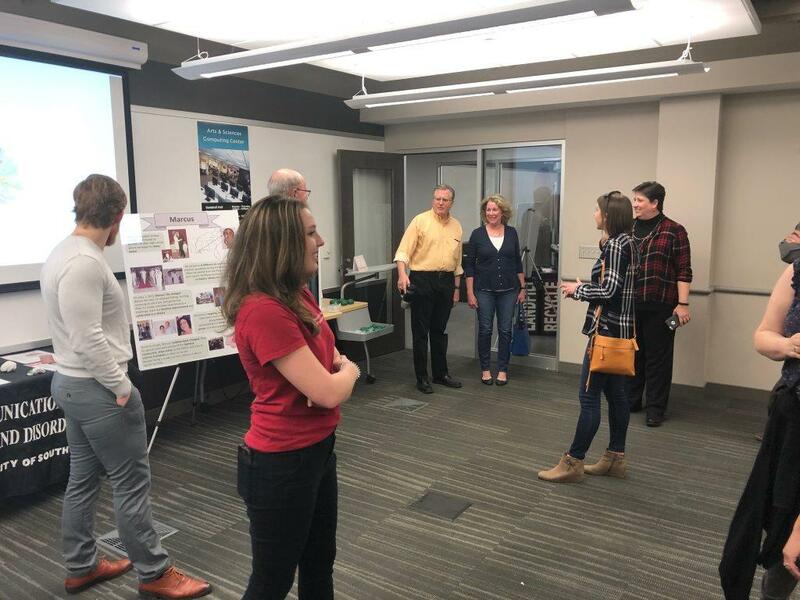 They contributed to the planning process in preparing the exhibit and shared their personal experiences related to living with aphasia with individuals who stopped by CreateABrain. 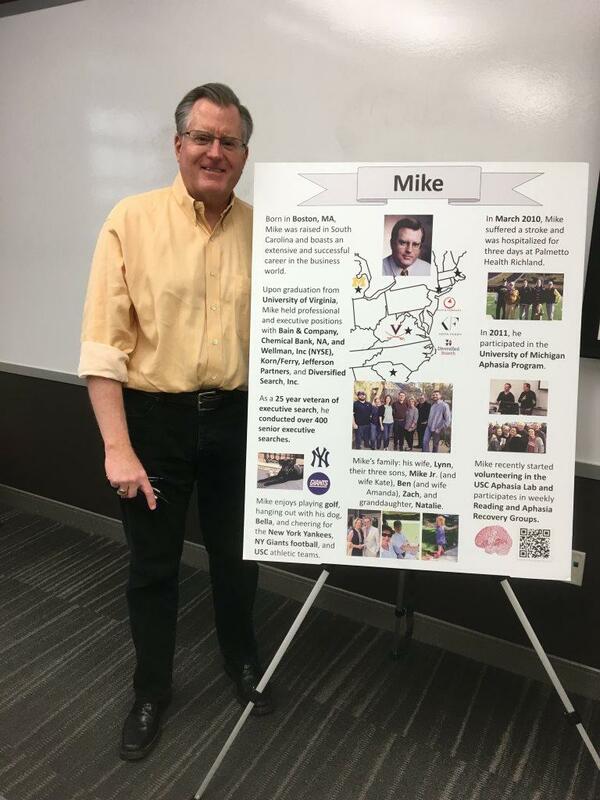 One of the participant/presenters, Michael (Mike) Wellman, shared how his life changed when he experienced a stroke and consequently aphasia in 2010. He describes being thrust into the world of post-stroke language recovery—a lonely place made less lonely by his participation in the Aphasia Lab. In addition to engaging in scientific studies that provide treatment through participation, Wellman is also active in several of the lab’s community outreach efforts, such as their recovery support group that meets for two hours every Friday for book club and group therapy sessions. He’s also improved his communication abilities through interactions and support from his wife and sons. 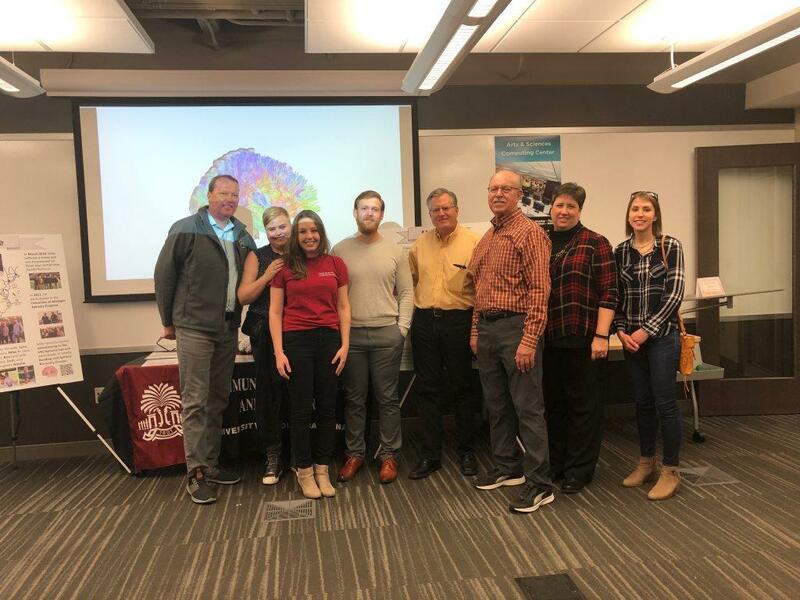 The Aphasia Lab shared information about stroke and recovery at their CreateABrain exhibit during UofSC's Creativibe event.